THE SKINNY: I could see the oil dripping from my hair. Which is funny since Living Proof Satin Style Serum contains no oils. Whatever is in it, it made my hair gross. Slimy, oily, greasy. You could even see it in a ponytail. I guess I can understand how it would tame frizz. But this is a definite don't for me. It was so bad I went back and double checked that I had, in fact, followed the instructions. The tiny packet said to use all of the serum, rub between hands and smooth in damp hair (while avoiding the roots). Then blow dry or style as usual. I did everything right, but this product was all wrong. And I am so utterly disappointed. I have fallen in love with the Living Proof brand until this point. At least the sample was free and I did not fork over real money for the full size. 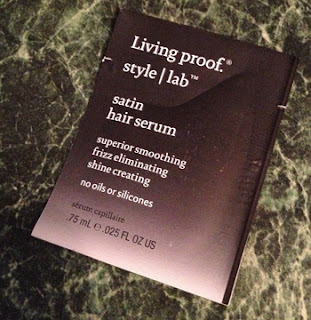 CHECK IT OUT: This is the first and only Living Proof product that I have not been thrilled with. You can find the full line online and in stores.